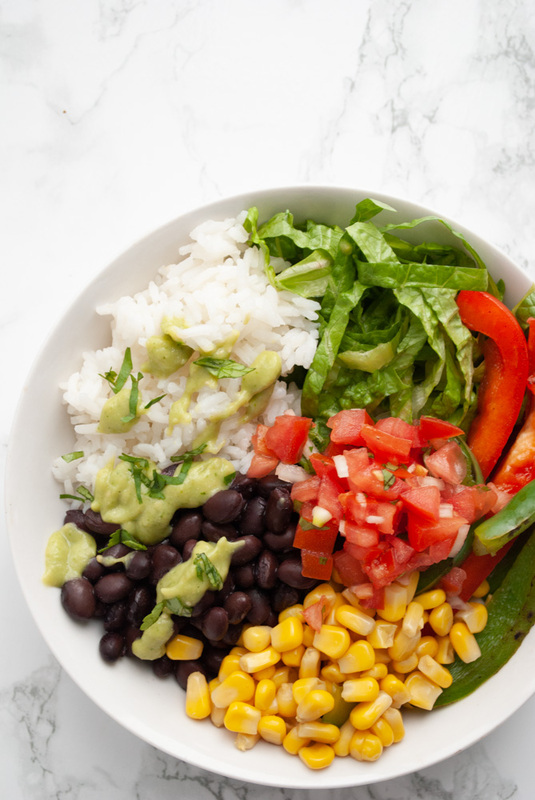 This black bean burrito bowl is an easy and healthy vegan bowl perfect for a quick and nutritious lunch or dinner. 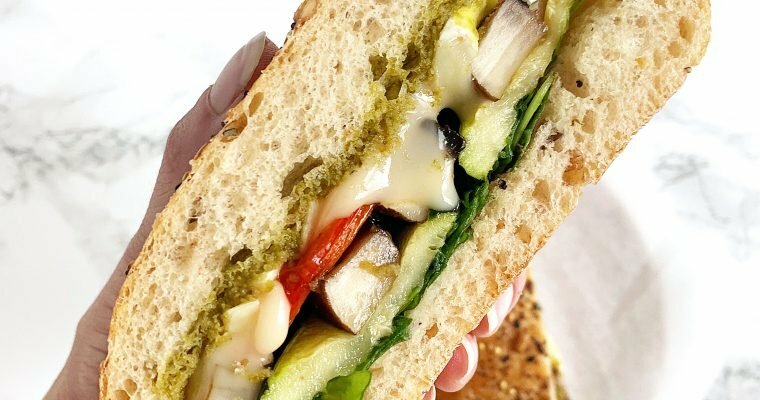 Easily adaptable to suit your tastes, meal prep option included! Burrito bowls are one of my favourite healthy meals. This vegan burrito bowl features black beans, rice, corn and peppers, but it is easily adaptable to your dietary needs. Don’t do grains? Switch out the rice for cauliflower rice, etc. I love serving this bowl with hot vegetables and rice and topping it with cold lettuce, pico de gallo, and dressing it with avocado salsa verde for contrast in temperatures, but this bowl is just as good with all the ingredients served cold as a salad. Looking for an easy weeknight meatless meal your whole family will love??? You’ve definitely got to check this one out! Is a burrito bowl healthy? I’d have to say that depends what you put in it. 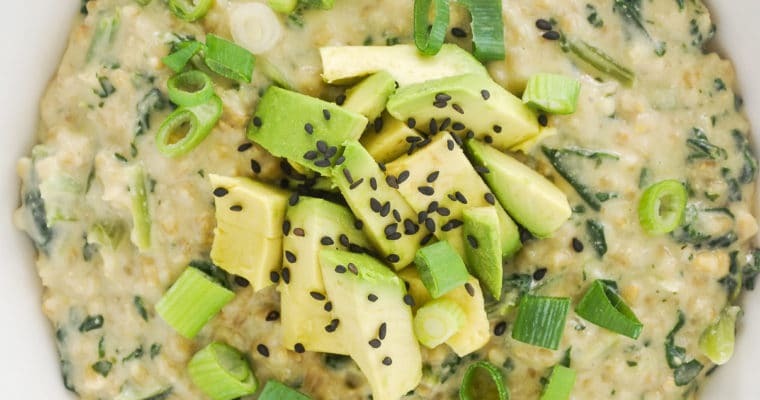 This bowl as the recipe is written is a really healthy bowl! 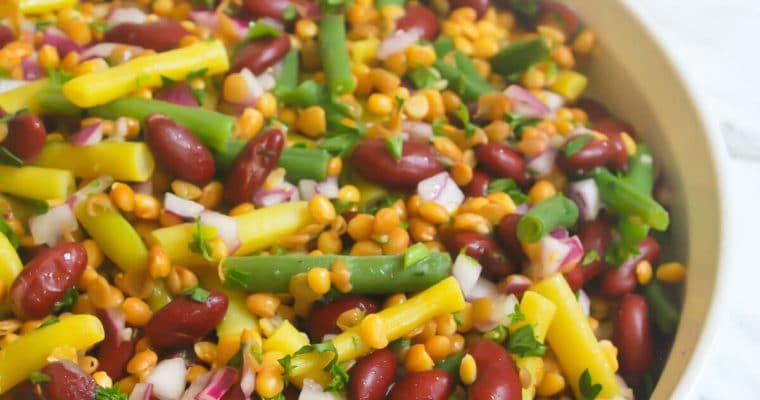 It contains rice and beans to make for complete proteins and it is full of fibre from all the healthy vegetables. Add to that an oil free dressing, and you’ve got an all around healthy meal. Feel free to dress it up with some more indulgent toppings like cheese or sour cream if that’s your thing though! Start with whipping up a batch of avocado salsa verde in your food processor or blender. Slice up your peppers and stirfry them in a heated cast iron skillet or frying pan over medium high heat for 3-4 minutes – you want the veggies heated through but not cooked until they are mushy. When you are done with the veggies add the strained black beans and corn to the pan and heat them through while sitrring so they don’t burn to the pan. This should only take a minute or two. Heat up your cooked rice, then divide up the rice, black beans, corn and peppers between 4 plates. Top with shredded lettuce, pico de gallo and dress with the avocado salsa verde. These burrito bowls are one of my favourite meal prep lunches! To meal prep these black bean burrito bowls simply spread out the recipe amongst 5 meal prep containers. You can put all the ingredients together and have it cold, or you can package up the rice, beans, and stirfried veggies in a container to heat up, and the cold ingredients on the side to top with. Toss the diced roma tomatoes, red onion and cilantro together to make a quick pico de gallo. Season with salt to your taste. Slice the green and red peppers then add them to a large cast iron pan or nonstick pan over medium high heat. Cook the veggies for a couple of minutes while stir often to keep them from burning. Remove the veggies from the pan, and then use the pan to heat up the drained black beans and corn. Divide the rice, black beans, corn and sauteed peppers between 4 plates. Top each plate with the shredded lettuce and pico de gallo then dress with the avocado salsa verde. I love the sound of this for an easy, delicious dinner! Plus it’s such a crowd-pleaser – like Chipotle in our own home! Exactly!!! It’s pretty much how we get our Chiptole fix around here since we live so far from one! This burrito bowl was so delicious, I added some extra cumin to my beans and some avocado on top. Sooo good! Thanks for posting this great vegan burrito bowl option. I am new to the vegan way of eating, so this was a great way to start. What a perfect summer lunch, supper or even snack … heck, I’d be tempted to have this for breakfast also.